Dharmasthala: Senior Manager of Shri Kshethra Dharmasthala Rural Development Project Sheena Devadiga retired from service after 33 years of service in the institution on February 28. 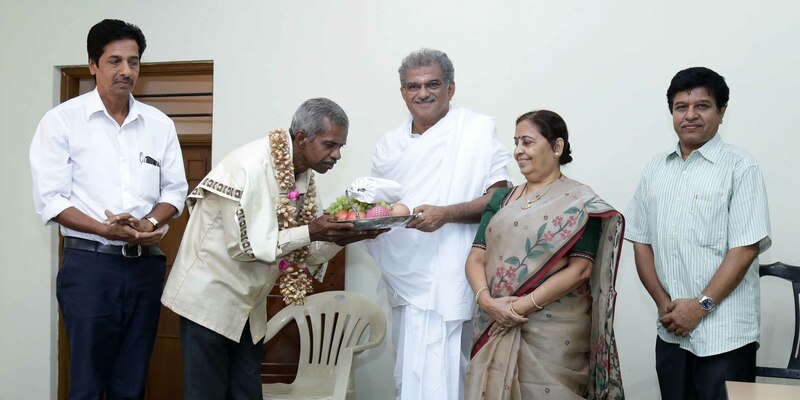 A formal sendoff function was organised in the head office of SKDRDP in the presence of Dr D Veerendra Heggade, Trustee Mrs Hemavati Heggade and Executive Director Dr L H Manjunath. In his message, Dr Heggade hailed Sheenappa Devadiga and said that his professional life can be model for others. “Our sincerity should not be eyewash. We can cheat our boss, but not our inner self and God. One who finishes his service with sincerity, feels fulfillment at the end, those who indulge in corruption go down in a feeling of guiltiness and he would not get any respect,” he said. Even the colleagues of Sheena Devadiga were impressed by his devotional hard work, love and commitment. Sheena Devadiga, who started his service as accountant 33 years ago in March 12, 1984, humbly said that time-to-time motivation of Dr D Veerendra Heggade helped him to serve the organisation. “Organisation grew, workstyle changed a lot, but the cooperation and help of the Executive Directors and other staff, cheered me up to play the new roles, “ he recalled. Dr Heggade felicitated Sheena Devadiga with a shawl, fruits and with honourary cash amount.